Let's just declare this the, "If at first you don't succeed, try and try again" week. Okay? Because I am in! 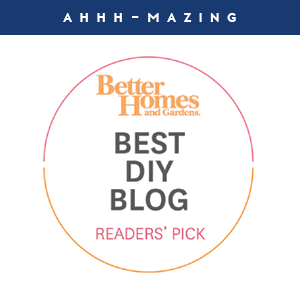 And before we enjoy today's amazing space, I just wanted to take a moment and say thank you so much for your kind comments on this week's kitchen post. I am still in the process of replying to comments, but I have enjoyed reading each one. And I agree, I am probably being too hard on myself, but it is hard to admit mistakes to myself, to my husband, to our family and to the internet world. Especially when those mistakes may ultimately require a redo or may have been costly. But you know what I loved most? Hearing your stories! And knowing that some of you are on your 7th lighting fixture or 4th dining chair. I don't believe in settling and I appreciate hearing I am not alone, just as much as you appreciate hearing trials and errors from bloggers. It is so fun to relate with others in similar situations, so again, THANK YOU! 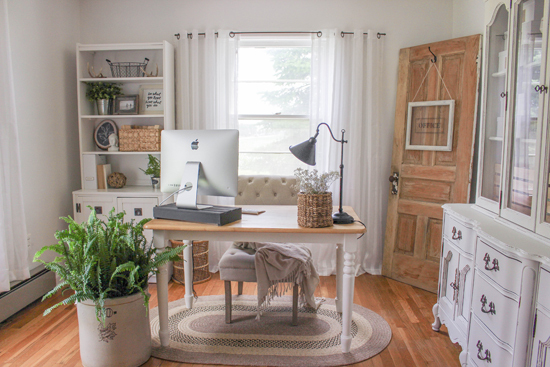 Today's reader, Liz from Love Grows Wild, created an absolutely stunning and serene home office. But it didn't happen quickly and she didn't settle. Her story really stuck out to me, and I couldn't wait to share it with you. It's OK to make changes and updates to your spaces until you love them. It is OK to DIY and then change your mind. 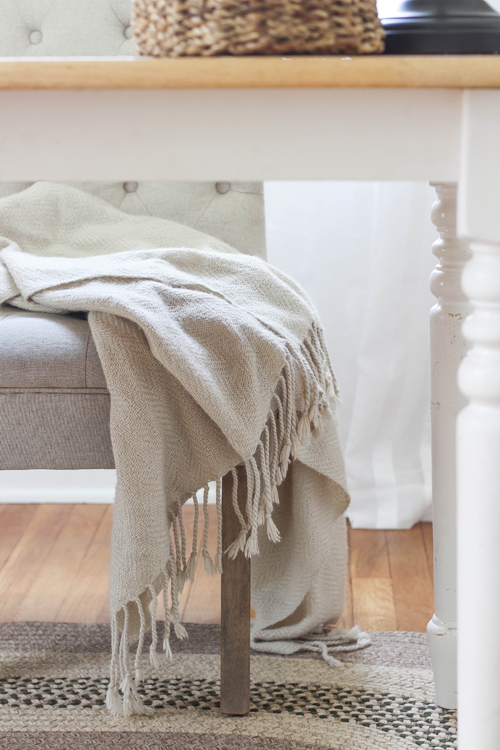 It is OK to plug away at a space until your personality and style finally shines through. Liz's home office is a testament to that! And her blog?! Let's just say, it's a keeper. I love checking in on her inspiring photography and beautiful projects. 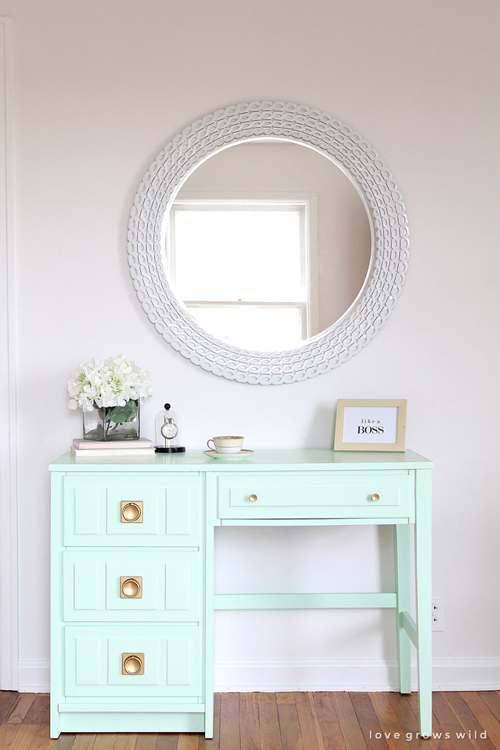 You may remember her magical mint desk that went viral last year. "A whole year… yes, I know. What the heck took me so long, right? When I started this makeover last summer, I really wanted to challenge myself. I didn’t want to just slap a couple pictures on the wall, maybe paint a piece of furniture, and call it a day. I wanted to design a room from top to bottom that was beautiful, functional, organized, and 100% me. The problem was, (as I would soon discover) that I didn’t exactly know what 'me' was." But with time, Liz discovered her style and created an absolutely beautiful space. I asked Liz to stop by today to share her home office story with us. 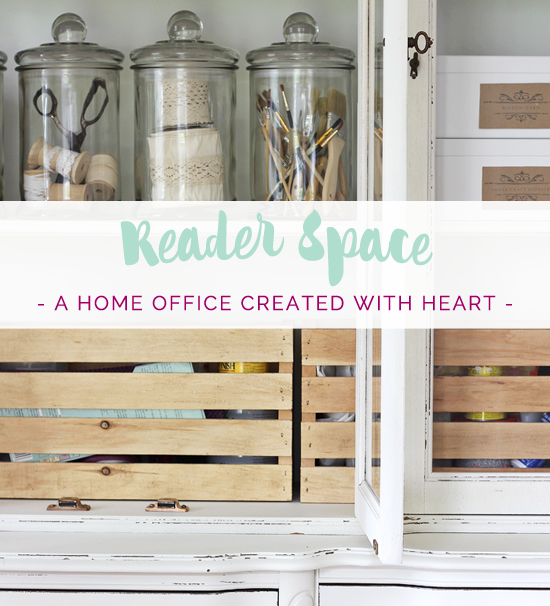 A home office that was created with heart. 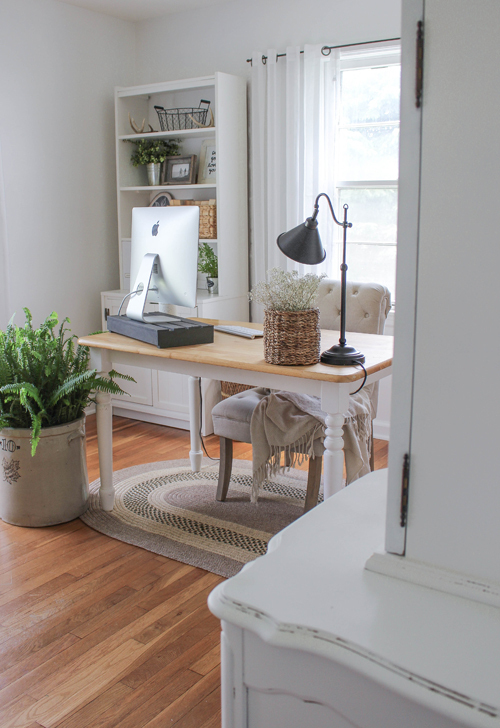 "This room functions as our home office as well as a space to run my business. As I blogger, I needed this room to serve several different purposes: an area to work on the computer, plenty of space to do DIY projects, and a light, bright spot to shoot photography in. Getting this room organized was key to being able to accomplish all these tasks!" 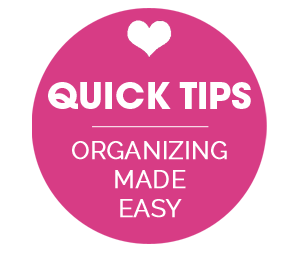 "Get rid of anything you don't use on a regular basis and have a spot for everything you keep! Clutter tends to drive me crazy, so I regularly purge our home of items we no longer use or don't have space for. Depending on the item, I'll either donate or sell on Craigslist and garage sales. Then, once I know what is going to stay in the house, I find a specific spot for everything. 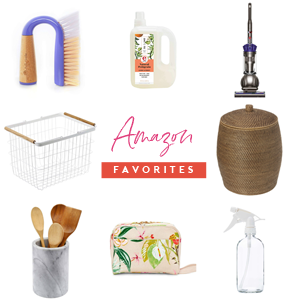 I'm known to make a huge mess when in the office when working on projects for the blog, but because everything has its place, clean-up is a breeze!" "I knew I was going to need a lot of storage space for this room, and I happened to have an antique china hutch in our dining room wasn't being used. 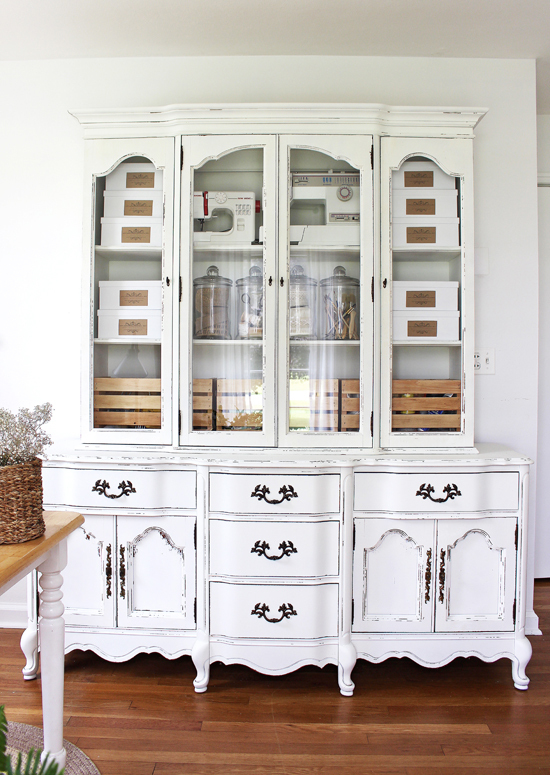 We moved the big china hutch into our office and updated it from dark wood to clean, bright white using chalk paint. I added large glass jars, wood crates, and photo boxes to the shelves to hold a lot of my craft supplies and used the bottom half to hold office supplies. 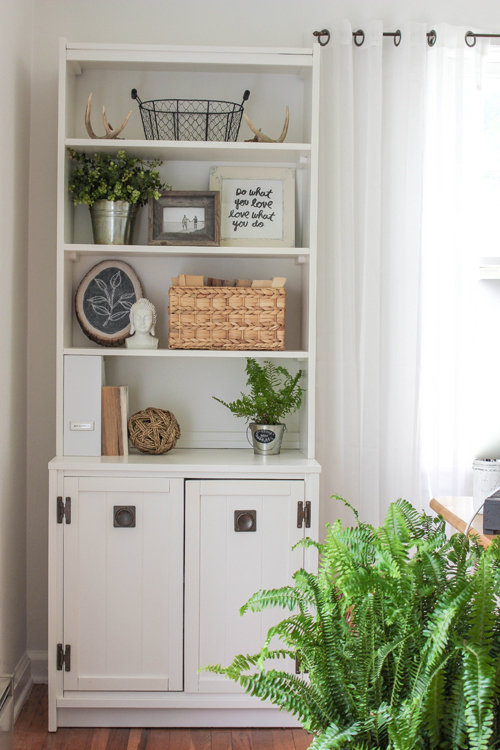 The large hutch really makes a statement in the room and added a TON of storage for us!" "I painted the walls and a lot of the furniture white and added some lovely vintage pieces that gave the room my signature farmhouse style. Rather than placing my desk up against the wall, I floated it in front of a sunny window to make a much more enjoyable place to work all day. In the china hutch, I used glass jars to hold spools of pretty ribbon and paint brushes, which both stores them and creates a beautiful display. 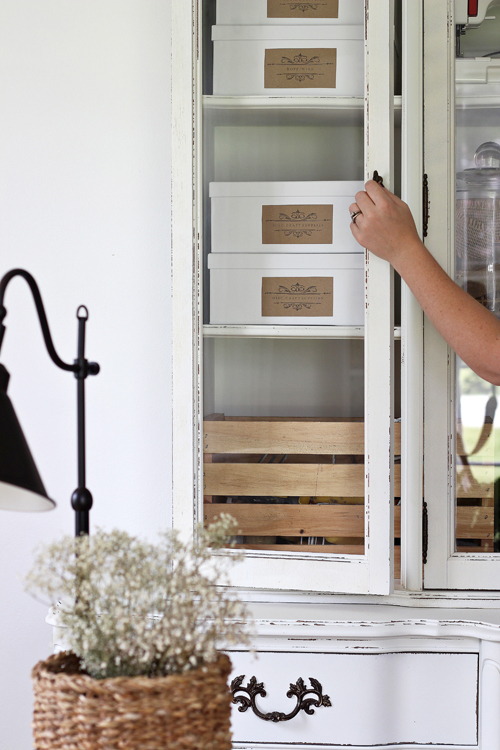 To add style and functionality to the plain white photo boxes in the hutch, I created little vintage labels on my computer and added them to the boxes using double-sided tape." "Rather than purchasing brand new furniture for the room, I re-purposed and re-finished a lot of pieces we already had. The hutch from the dining room and an old cabinet and book case were painted white to give the room a cohesive look, and I found my desk (which is actually a farmhouse dining room table!) for a great price at an antique store. I also brought in a round braided rug from our patio to use under my desk and made a DIY framed dry erase board to help keep me organized!" "Before I started this makeover on the office, the room was cluttered and uninspiring. The walls were dark gray, not a single piece of furniture matched, and I didn't have anything organized. Now that the room is finished, I'm able to get so much more work done in a day! It functions as I need it to and is a beautiful space to be in everyday." Crazy beautiful, right? Liz took her time to create a cohesive and thought out space that she can now use with a smile. 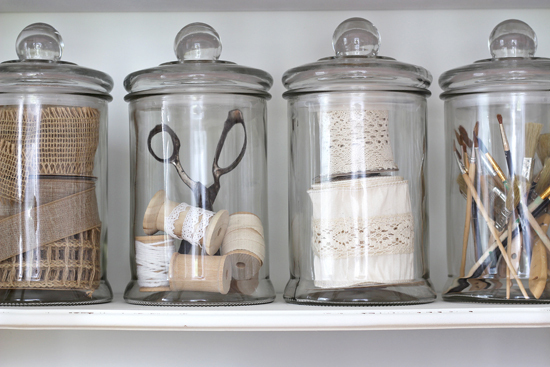 Her hutch paired with her glass jars, decorative boxes and crates is about the most beautiful combination I have seen. I am also smitten with her bookcase and all of her special touches throughout. You can tell she gave each piece her special touch, and carefully considered each item she added. A combination of old and new, everything she has done works in harmony to create a very peaceful place to work each day. 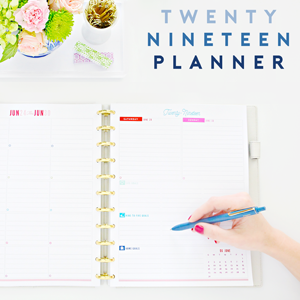 We live in a very fast paced world, and it is easy to just want everything done, right now! I know that I am not the most patient person when it comes to living in chaos and half-finished spaces. But take your time my friends. It is always worth it in the end. Liz shared her entire home office story as well as how she ultimately found her personal style, on her blog here. 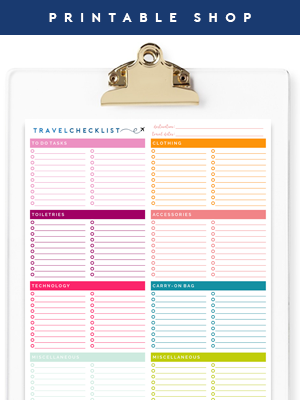 I hope you have a full cup of coffee and some time on your hands, because once you hop over, you will want to stay awhile to enjoy a plethora of project inspiration. Such a beautiful space! Has such a soft look, but still is crisp and clean! LOVE LOVE LOVE! I love the door in the corner. Great idea! I recently bought a new desk for my office/study and it looks wonderful. I use the space everyday. I just feel more efficient. My new office space is an attic and has slanted walls, this gives me the idea to just put the desk smack in the middle!!! I will definitely be adding more color though, the monotone white and brown is a little too ho hum for me. Wow! I cannot believe how much this room speaks to me. 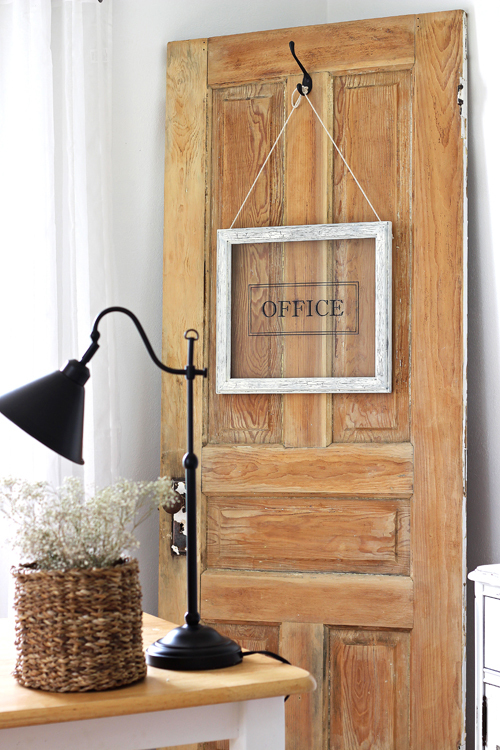 I've always loved the farmhouse style but this office takes my breath away. I'm sitting here in my own home office looking around trying to figure out how I can add some of what Liz did to this room. 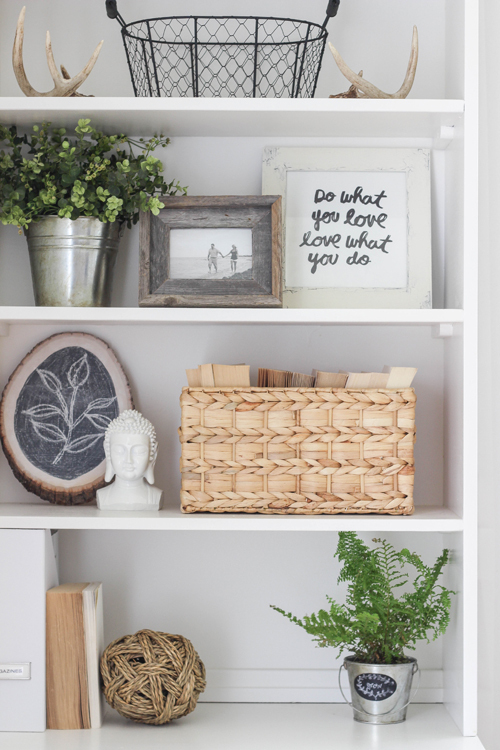 Thank you Liz (and Jen) for sharing your beautiful home office with us! Very cute! I could never do this! I love this office! So beautiful! Such an AMAZINGLY BEAUTIFUL office, a vintage retreat. I love this style and I think I may dream about this one for a while. A vintage lovers dream, be still my heart. Thanks for sharing Jen and Great work Liz!! Such a beautiful space! I would absolutely be inspired working in there. I love the color of that mint green desk. It's so eye-catching and fun!